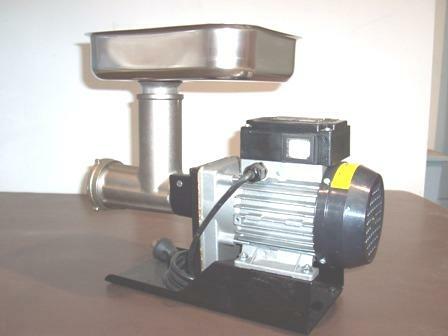 Quality Italian Made FLB Mincing machines available in two sizes 22mm and 32mm mincing plate and knives. Saucing attachment optional extra. Technical characteristics of meat grinders motors: Spheroidal cast iron main gear. motor asyncronous with condenser. tension 220 V. 50 Hz.power 100 Watt. Output revolution 110 rpm. permanent grease lubrication. Available in every tension. T.C.22 HUNGER SYSTEM today is available on our meat grinder TC22 the Hunger system, till today used just in butcher equipment. Thanks to this system it is possible to obtain a really thin ground meat working it just once. The knife, with replaceable blades, works on two plates cutting the meat twice.